Some vinyl flooring brands we carry. A close-up of a vinyl floor. Today's vinyl floors look so real! Vinyl flooring has almost completely replaced linoleum flooring as the flooring of choice for areas that get wet or have occasional spills. They are easy to mop clean. There is so much available in vinyl flooring, and the detail and realism is so much more realistic than years ago. Patterns include tile, stone, and wood. Vinyl floors come in two main types. Sheet vinyl comes on a roll like carpet. We cut off enough vinyl to do your room, and most rooms are done in one piece. Sheet vinyl has fewer seams, so liquid spills are less likely to soak through cracks into the sub-floor. You can learn more about sheet vinyl floors here. VCT or vinyl tile used in an office setting. The other type of vinyl floor is vinyl tile and vinyl plank flooring. These can be either the industrial looking vinyl squares (VCT, for vinyl composition tile), or they can be luxury vinyl tile. Luxury vinyl tile has many design choices such as tile and wood designs. Vinyl tiles and planks are easy to repair if you have extra flooring left over. A damaged tile can be removed and replaced without the need to replace the entire floor. Prices start at just $3.99 per sq. ft. including installation (65 sq. ft. minimum). Our most popular patterns are $5 to $8 per sq. ft including installation. And some premium vinyl floors can cost up to $12 per sq. ft. Our selection and price ranges can change at any time. Additional floor preparation may be necessary and is not included in these prices. We can determine if this is necessary when we visit your home. We have hundreds more colors and patterns available! How Do I get a vinyl floor that looks this nice? To get a vinyl floor that looks this nice, just visit us today. Or call or click to schedule free shop-at-home service. Can I install vinyl flooring myself? That's not wood? No. It's a vinyl floor that looks like wood! We never want to discourage anyone from believing in their own abilities, but installing vinyl flooring is not a good do-it-yourself project. Vinyl flooring is difficult to install, and quite unforgiving. Our professional installers will insure years of future enjoyment. Ironically, a manufacturer web-site suggests that vinyl floors are the easiest floorcoverings to install. We believe that is wishful thinking from someone who regularly installs vinyl floors, so yes, it is easy ... for them. But the average do-it-yourselfer will be frustrated and disappointed with the results. Almost all vinyl floors today use NO wax. There are cleaners for vinyl floors that will also restore luster, which we have available for sale. Commercial VCT does require an occasional polishing, although very high end VCT might require no polishing or only one coat of polish when first installed. Vinyl flooring is the best flooring for a basement, right? Maybe. This is a common misconception. Concrete seems like a solid material, but it is actually quite porous. Water VAPOR (not necessarily liquid water) travels easily through concrete. When a porous floorcovering is used (like carpet), the water vapor goes through the floorcovering and dissipates into the air above. But when we cover the concrete with a non-porous floorcovering like vinyl or rubber, the water vapor becomes trapped. This can develop into tremendous pressure underneath the floor. This can compromise the adhesive, and the floor becomes separated from the concrete. The water vapor can also liquefy under the floor, creating an environment that is conducive to mold growth. If your vapor emission is low enough, you may be able to use a standard vinyl floor. There are also floating vinyl floors that can be used in basements (yes, we have them). Floating vinyl floors are generally thick and very heavy. Weight keeps them down, and they are not glued to the concrete. Even these floors have limits on how much water vapor can seep through the floor in each 24 hours period. We will test your concrete first to determine if you can safely use a vinyl floor or not. An amateur will say "you won't have any problems" because they are untrained. A professional will test your floor, and help you avoid future problems. And what if you can't use vinyl in your basement? Then we can show you other floorcoverings that may be more appropriate for your needs. Can I install a vinyl floor over ceramic tile? In general, no. Ceramic tile has grout lines. When you put a vinyl floor over ceramic tile, those grout lines will eventually telegraph through the vinyl. Someone may suggest using leveling compound to smooth out the grout lines. In theory, this is possible. However, our experience is it takes so many applications of floor leveler and labor to completely remove the indentations that we are better off removing the ceramic tile and laying a suitable underlayment for your vinyl floor first. Then we know you won't have problems. Can I install a vinyl floor over another vinyl floor? Maybe. The original vinyl floor must be completely glued (not loose and not glued on just the edges). The original vinyl floor must be solidly adhered to the floor beneath it. If we glue a new vinyl to a loose vinyl, we will end up with loose vinyl. So we need a vinyl that is solidly adhered. The original vinyl may have some slight texture, and this could telegraph through the new vinyl. Therefore, we'll use a leveling compound to smooth the existing floor before laying the new floor. 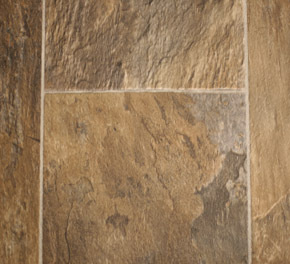 This is not like ceramic tile, though, since the texture a vinyl floor may have is minimal compared to the deeper grout lines that ceramic tile has. Can you pull up my existing vinyl or linoleum floor? A licensed asbestos mitigation professional. The homeowner may remove asbestos, providing they make proper filings, follow all laws, thoroughly wet and double bag the material, can not make any compensation to voluntary helpers, etc., etc. The fines for failure to comply can be severe. And the state's DEP highly recommends the homeowner uses a professional. These laws are designed to protect you. How do you know if your floor contains asbestos? It is lawful to remove a small sample for testing purposes. If we are to remove an existing floor, we require certified laboratory results. The homeowner's word or signed statement, dated or undated sales receipt are not sufficient evidence of a lack of asbestos. Only a certified laboratory report is sufficient. There is a nominal fee for testing flooring. I have an asbestos floor and can not afford to have a licensed professional remove it. What can I do? You can go over the existing floor. It is illegal for unlicensed professionals to move or remove asbestos containing materials. But it is perfectly legal and safe to cover an asbestos floor.